We lived side by side with the Neanderthals for tens of thousands of years; before the ultimately went extinct. For years palaeoanthropologists have been asking: why were we the species to survive? After all, contrary to popular opinion, the Neanderthals had a lot going for them. They were strong, smart and even had bigger brains than us. How could us weak, small-headed humans from down south have succeeded where our brawny cousins failed. The only advantage we seemed to have was a forehead. One of the most popular explanations for their demise is that they were simply inefficient. Their strong muscular body and large brains required a lot of energy to sustain. Estimates suggest that Neanderthals would’ve needed 4,000 calories a day; double our measly 2,000. Some of the more extreme proponents of this hypothesis have even argued that this is why Neanderthals didn’t make cave art like humans, or innovate quite as much as us. Gathering all the calories they needed to survive took too much time and so they couldn’t afford to sit around wasting energy doodling with tools or playing with rocks. However, I suspect this claim could be categorised as something that rhymes with “full wrap”. Anyhoo, the Neanderthals were quite short (an adaptation to the cold climate they lived in. Being shorter reduced surface area exposed to the elements, minimising heat loss). As such their steps would be shorter, making walking less efficient. Some estimates indicate that it would’ve cost Neanderthals 30% more energy to travel from point A to point B than humans. So not only did they need more energy to survive it cost more gathering that food in the first place. However, a new study has challenged these conclusions. The 30% more energy claim was based on a very simple model of Neanderthal locomotion. Two researchers from the Czech Republic created a more complex model that more accurately modelled Neanderthal locomotion. Their results effectively slashed the amount of extra energy Neanderthals in half; indicating they only needed 14% more energy than us for walking. What’s more, most of this additional cost was the result of the fact Neanderthals – with their larger brains – had higher metabolic demands. If you look at just the energy each species spent on walking the Neanderthals were actually more efficient than humans! It’s just their basic metabolism that pushes them over the top. So this research doesn’t disprove the “expensive Neanderthals” hypothesis; effectively showing that they did need more energy to function than us. But it does show that they didn’t need more energy to travel, which raises the question: would they still have been inefficient enough to go extinct? Would their higher metabolism alone been enough to hamper their ability to compete with modern humans as we encroached on their territory? There’s been a long tradition of scientists underestimating Neanderthals. First we thought they died out because they were dumb, which turned out to be false. Because they didn’t cook their foot, making digestion more expensive. Also false. They relied solely on meat, so couldn’t as effectively exploit their natural habitat. That turned out to be wrong too! And we thought they were rubbish at walking. Hora, M., & Sladek, V. (2014). 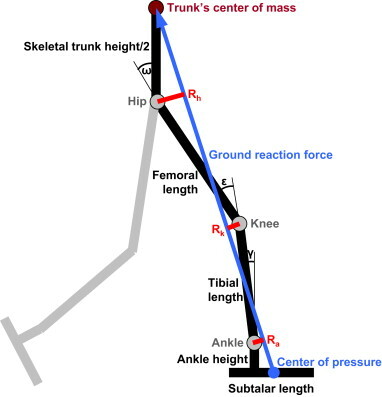 Influence of lower limb configuration on walking cost in Late Pleistocene humans. Journal of Human Evolution. Isn’t populaiton fragmentation the most plausible explanation for their demise? That’s certainly a very plausible explanation; although I’m always a bit wary about looking for a single silver-bullet type explanation for evolutionary things. Nature is a messy thing. Its because they didn’t have chins, uh huh That’s it. They always compare Neanderthals to AMH from Africa. I’ve been wondering how Neanderthals compare to modern peoples from the Arctic? I also prefer the theory that they didn’t go extinct. They just intermingled. The comparison with Arctic people is interesting. You’d expect there to be many similarities, given they’re both cold adapted. And there are several key ones. Both are short for example. However, there are some other differences. Neanderthals have very large noses, which was always thought to be connected to the cold. Yet people from the Arctic actually have relatively small noses. I enjoyed your article and agree with what you say. I’m in the minority but I do not accept the idea that Neanderthals are a separate species, but rather believe that they are a highly variable sub species. I thus continue to call them Archaic Homo sapiens and will until better evidence proves me wrong. Here’s why. 1. A major problem with genetic studies of Neanderthals is that while the new DNA results are certainly important and welcome, they are based on material from an extremely small sample of individuals. Until we can get DNA from many individuals from different geographic locations (The Near East to Western Europe) and different times (35,000 to 200,000 years), we cannot be certain that the magic number of from 2 – 4% Neanderthal DNA in present day people of European ancestry is an accurate estimate. 2. It is misleading to compare DNA from 50 – 60,000 year old individuals with DNA from modern day populations. Given mutational rates and other evolutionary forces, wouldn’t one expect DNA from individuals separated by such a large time gap to be different? 3. When one looks at the fossil evidence, determining which individuals are/aren’t Neanderthals is highly subjective. The same form is often classified as a Neanderthal by one and a Homo sapiens by another. The abundant evidence from Krapina in Croatia is highly variable with some forms looking remarkable modern. The same can be said of many other examples classified as Neanderthals, especially those from eastern Europe. In sum, Neanderthals were a highly variable lot and stereotyping cab produce forced results. The archaeological evidence that you discuss speaks for itself and is convincing proof that Neanderthals can justifiably be compared to hunter gatherers of more recent times. Personally I swing back and forth on the issue of how to classify the Neanderthals. The notion that they are merely a sub-species of archaic Homo sapiens is certainly compelling. However, until the conclusive evidence comes out I swing more towards labelling them as a distinct group, purely for pragmatic reasons. It’s a specific label that allows for them to be easily discussed. Speaking from a layperson’s perspective, it seems the entire field of human evolution research is plagued with over generalization from too little evidence. Every time someone finds a homonin jaw fragment, it’s a new species. Broad pronouncements are made based on tiny dna samples. I mean no disrespect, I’m sure some of it has to do with seeking funding, but it often looks to me like self promotion. Most of the differences between two species are in the soft tissue. Their reproductive ability, colouration etc. All of this is lost when it comes to fossils, making it much harder to pick out where one species ends and another begins. This is particularly difficult when dealing with evolutionary change, as these creatures are all morphing and changing into each other anyway. As a result it’s a rather persistent “problem” that lots and lots of species tend to be identified; species which are often shown to be more closely related as more fossils are found. Even when looking at dinosaurs this sort of thing happens; and every few years some news emerges about how this or that species is just a young/old version of some other. Is it necessarily a problem though? This is the on-going debate between lumpers and splitters. The latter think we should err on the side of caution, only grouping fossils together as the same species when there is a lot of evidence for it. This also has some pragmatic benefits. If a label only refers to a handfull of fossils then its easier to know what people are talking about. Lumpers take the opposite approach, arguing we should try and be as biologically accurate as possible, even if it means we sometimes fail to spot new species.